Tất cả điều là file *.app download direct từ Mac App Store, không chỉnh sửa, không tích hợp gì khác vào! Chú ý: Xoá tập tin _MASReceipt( nếu có) trong đường dẫn /Install OS X xxxxx.app/Contents/ để có thể cập nhật mà không bị đòi tài khoản. Tiger was initially available in a PowerPC edition, with an Intel edition released beginning at 10.4.4. There is no universal version of the client operating system, although Tiger Server was made available on a universal DVD from version 10.4.7. While Apple shipped the PowerPC edition bundled with PowerPC-based Macs and also sold it as a separate retail box, the only way to get the Intel version was bundled with an Intel-based Mac. However, it was possible to buy the ‘restore’ DVDs containing the Intel version through unofficial channels such as eBay, and officially through Apple if you could provide proof of purchase of the appropriate Intel Mac. These grey colored ‘restore’ DVDs supplied with new Macs, are designed to only restore on the model of Mac that they are intended for. The retail PPC-only DVD can be used on any PPC-based Mac supported by Tiger. Mac computer with an Intel processor (IA-32). "Yonah" processors such as Core Solo and Core Duo can run only 32-bit applications; later x86-64architecture processors such as Core 2 Duo are also able to run 64-bit applications. In Snow Leopard, most built-in applications have been rebuilt to use the 64-bit x86-64 architecture (excluding iTunes, Front Row, Grapher and DVD Playerapplications). They will run in 32-bit mode on machines with 32-bit processors, and in 64-bit mode on machines with 64-bit processors. The first developer preview of Lion added TRIM support for Solid-state drives (SSD) shipped with Macs, which is also included in the latest version of Snow Leopard (10.6.8) shipping with current MacBook Pros before July 20, 2011. Other SSDs have built-in TRIM-like optimization, while yet others require OS patching. AirDrop is supported on the following Mac models: MacBook Pro (late 2008 or newer), MacBook Air (late 2010 or newer), MacBook (late 2008 or newer), iMac (early 2009 or newer), Mac Mini (mid-2010 or newer), Mac Pro (early 2009 with AirPort Extreme card and mid-2010 or newer). As in 10.7, the earliest models supporting AirDrop are the late-2008 MacBook Pro, late-2010 MacBook Air, late-2008 MacBook, mid-2010 Mac Mini, and early-2009 Mac Pro with an AirPort Extreme card. Any Mac released in or after 2011, except the MacBook, supports AirPlay Mirroring. Power Nap is supported on the mid-2011 or newer MacBook Air and “retina” MacBook Pro. 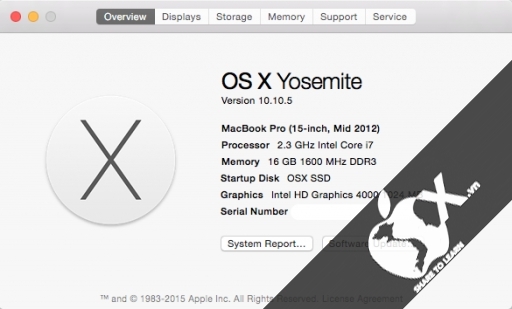 OS X Mavericks is compatible with most Macs that are capable of running OS X Mountain Lion; as with Mountain Lion, 2 GB of RAM, 8 GB of available storage, and OS X 10.6.8 (Snow Leopard) or later are required. Mavericks is free to upgrade and all later versions are free. The developer : iTunes Sarl © Apple Inc. Some features require Apple ID;required to comply with conditions. The macOS Sierra 10.12 improves the stability, compatibility, and performance of your Mac. Updating macOS High Sierra 10.13.2 contains a number of improvements aimed at improving the stability, compatibility and security of your Mac. • Compatibility with certain third-party USB audio devices is improved. • Improved VoiceOver navigation when working with PDF documents in the Viewer. • Improved compatibility of braille displays with the program "Mail". New technologies used in the operating system, make the Mac more reliable, functional and fast. Now he is ready for future innovations. In addition, the macOS High Sierra has improved features and applications that you use every day. macOS took a new height. It's out this fall. Move mountains with new technologies. New base technologies in macOS High Sierra have allowed to improve the basic functions of Mac. Today, Mac is a new storage architecture, improved video viewing capabilities, full access to the resources of powerful graphics processors. And not only. Apple file system. New top-management data. Documentation. Photo. Mail. Applications. Everything that's so important to you is perceived by the Mac as data. And the file system is responsible for organizing this data in the form of files and folders and gives you access to them. Our previous file system was developed for the early Mac models and perfectly coped with their tasks. But the modern Mac works on the basis of flash drives, and this opens up great opportunities for innovation. Therefore, it's time to lay the foundation for the future. In macOS High Sierra, we are introducing for the first time on Mac the Apple file system with an improved architecture that provides a new level of security and speed. HEVC. The new video standard. On the growing popularity of video 4K Mac meets the new standard HEVC (High Efficiency Video Coding), also known as H.265.1 It is able to compress video up to 40% stronger than the current H.264 standard. Therefore, video files in HEVC format are transmitted faster and take up less space without sacrificing quality. Metal 2. New graphics rules. Today, for effective work on the Mac, the graphics processor is more important than ever. And graphics processors are becoming more and more powerful. Metal technology, built into macOS, allows applications to use the graphic potential of the computer to the maximum. Its new version of Metal 2 is not only a new level of image quality, but also the possibility of machine learning, support for virtual reality and external graphics processors in entertainment and professional applications. With Metal 2, you can incorporate the imagination into full power - and playing games, and creating content, and developing software.